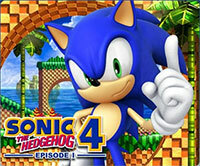 Sonic the Hedgehog 4 attempts to return to the classic roots that made the original series so successful. Over the years, Sonic has picked up many new friends, gimmicks and gameplay additions, which Sonic 4 eschews in the name of fanservice. However, for every step in the right direction that Sonic 4 takes, it takes another three steps backward, losing the essence that made the Genesis games fun and in the end, feeling more alien and foreign than nostalgic and familiar.